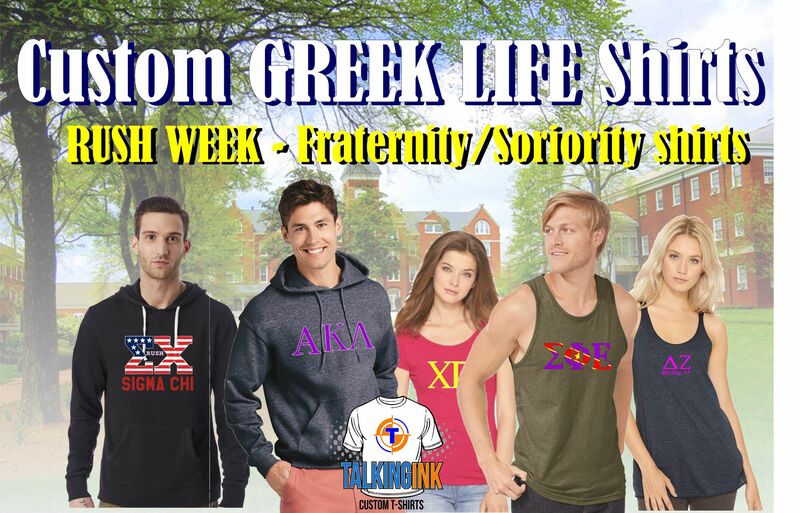 If you are looking to order custom greek life shirts you have come to the right place. We know the trends in both apparel and design so no worries if you don’t have your own design. We’ll be happy to put one together for you. Although experience shows us these college kids like to provide their own designs and generally they are pretty impressive. The popular trend for the past few years has been ordering the Comfort Colors brand. It’s not a trend we see ending soon because Comfort Colors does have really nice stuff. It’s the leader in garment dyed apparel and they have a full line from tees, tanks, and hoodies. So they have everyone covered. For a dyed garment they are very soft and come in unique colors on available in their own brand. Pocket tees are always a popular choice as are tanks. We’ve screen printed tanks for both men and women and tanks are a trend that comes and goes. Rush week is a huge time for custom greek life shirts. It’s a busy time of year for us but we still manage to get orders in and out in one week. We work with our greek life customers in a very simple process that ends with a detailed digital mock up for them to approve. The last thing college aged kids want is to spend good money and have the product end up not being what they wanted. Our digital mock ups preceeded by conversations make sure we are on the same page from the word go! No suprises, fast turn around on your custom greek life shirts. Talkinging custom t-shirts is a full service screen printing business. For years we have been printing shirts for sororities and fraternities of the greek life. One thing is that these kids want the best bang for their buck. We get it, college, budget, good times. We make it work and have grown our greek clientele considerably over the past 5 years. We provide great pricing with the highest level of professional screen printing. The best part is we turn the order around in 4-6 business days.